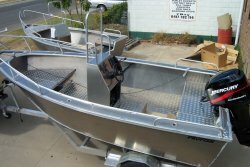 Profish Boats have been working on a new series of boats they call the "tuff tinnie" series. they have been developing these boats over the last few years and have now put them into production. Specifications are 13ft to 17 ft in length, 6ft 10in beam, and sides are full High Tensile 5083 plate construction. 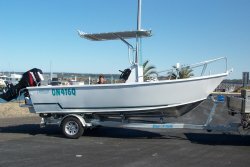 Robbie Clarey, a local fisherman has taken the first 14ft boat and in trials this boat has shown that it can carry lot of wieght in shallow water, is smooth riding, a stable fishing platform at rest and gives a dry ride at full power. the 14ft boat with an outboard of your choice on a redco trailer starts at (Contact Peter) and the 16ft Centre Console with an outboard of your choiceon a redco trailer will start at (Contact Peter). 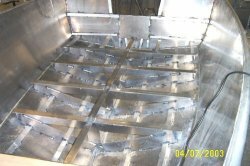 All boats are fitted out in our factory, and can be bought hull only or at any stage of construction. 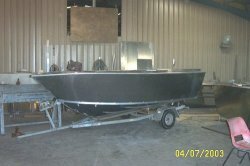 The beauty of buying a custom built boat is that you can change things to suit yourself. Standard features on all the boats are bow rails, bowsprit, anchor well, side pockets, carpeted floor and many other extras are available on request. 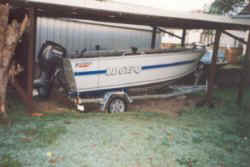 These boats have been called the "tuff tinnie" series, but there is no comparison between a pressed hull and a full plate boat. These boats have been designed to last and to take a pounding, as you would expect from a plate boat. Do yourself a favour and call in and see the boys at Profish Boats to talk to them about a new tuff tinnie that will do what you expect of a boat.